There's a much bigger text to be written here, about the time we started lettering our photocopied independent comics in the computer, about when we started having our comics lettered by other people, one of those being Nate Piekos, of Blambot fame (who, as we came to learn, had designed many fonts we were already using), and about the moment we decided to have our comics look a little more ours by lettering them by hand again. Hand lettering a comic is a lot of work. And, when you're publishing your stories in at least two languages (english and portuguese), it's impossible to do it all on the page. Because of that, even if we started hand lettering our comics, we decided it was time to turn our hand writing into computer fonts. And that's when we came back to Nate. 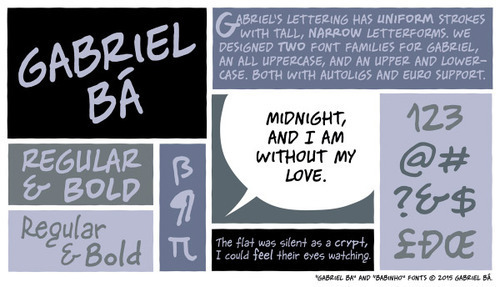 Besides being an awesome letterer (he lettered Umbrella Academy and Sugarshock for us), he also is a great font designer, and has made a lot of custom fonts for artists. 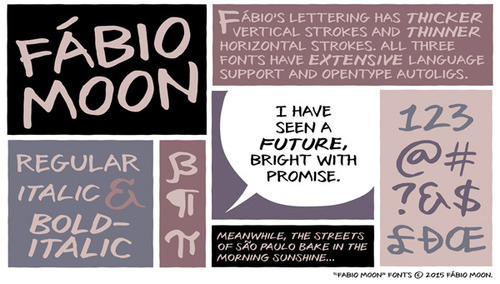 First, Nate turned Bá's hand lettering into fonts. 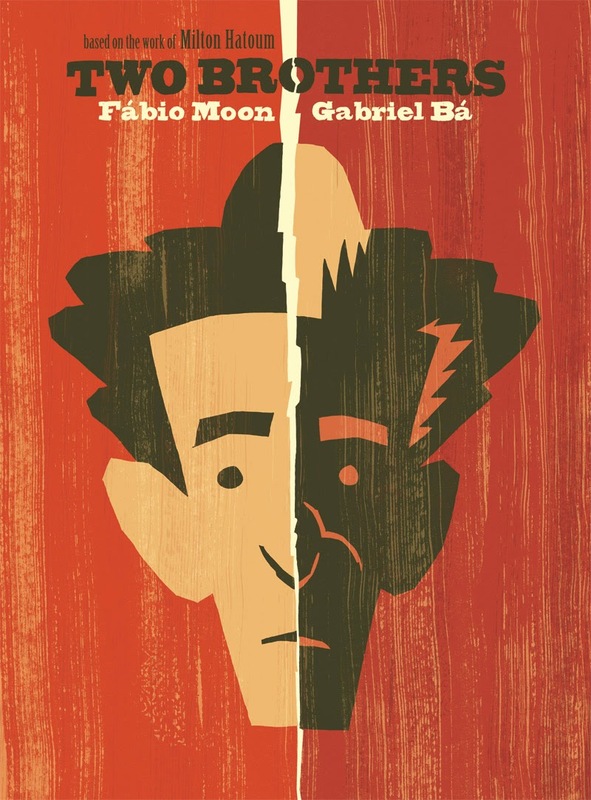 We were on the final stages of our new book, "Two Brothers", which we were already negotiating to be published in portuguese, in french, in english and in italian, and we really wanted it to have Bá's lettering in all versions. Both Bá and I have been hand-lettering our weekly strip at the brazilian newspaper, "Quase Nada", since 2008 (even though we replaced the letters with computer fonts for print), but since 2013 I have restarted to hand letter some short stories I was doing, to get better at it, and do try and really define my style. After the incredible results of Bá's custom font, we knew it was only a matter of time until we would hire Nate to do his magic on my font. I plan on continuing to hand-letter my comics whenever I can. More and more, I'm trying to make everything blend a little better, from the drawing, and the inking, and the balloons, and the letters, and the colors. Now, with these custom fonts, we can do that all around the world. After 4 long years working on this book almost in secrecy, we can finally talk a little bit about it. Our new book, TWO BROTHERS, is an adaptation of the novel “The brothers” (Dois Irmãos, in Portuguese), by Brazilian novelist Milton Hatoum. It’s the story of twin brothers Yaqub and Omar, and their family of Lebanese immigrants living in the port city of Manaus, on the riverbanks of the Amazon. It’s a story about identity, love, loss, deception, and the dissolution of blood ties. A strong story worth the huge challenge of adapting it. It’ll be publisher by Dark Horse and it’ll come out only in October, but you can see a 10 page preview at Publishers' Weekly.